Hunter College MFA Thesis Show December 15, 2010 through January 15, 2011. Opening Reception is Wednesday, December 15 from 6-9pm. 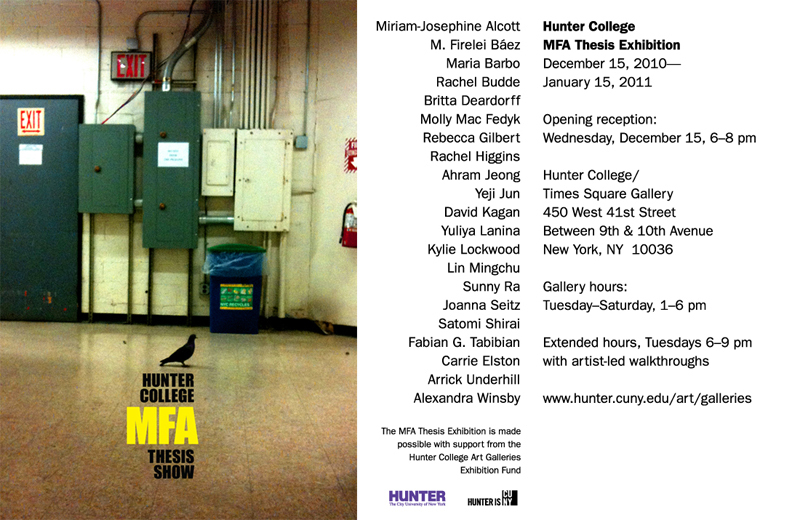 Hunter College Times Square Gallery is located at 450 West 41st Street (Between 9th and 10th Avenue), New York, NY 10036. Artists include: Miriam-Josephine Alcott, M. Firelei Baez, Maria Barbo, Rachel Budde, Britta Deardorff, Carrie Elston, Molly Mac Fedyk, Rebecca Gilbert, Rachel Higgins, Ahram Jeong, Yeji Jun, David Kagan, Yuliya Lanina, Kylie Lockwood, Lin Mingchu, Sunny Ra, Joanna Seitz, Satomi Shirai, Fabian G. Tabibian, Arrick Underhill, Alexandra Winsby. Bryan Drury "Recent works - Antibiosis"
The Contenders Featuring "The King's Speech"